For love of water, NATIVE created the digital initiative, #CloseTheTap with the hope to raise awareness around global water wastage and offer people real, every-day tips for saving water. The initiative kicked off on 22 March to commemorate World Water Day. 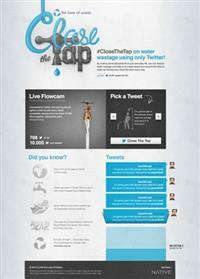 “Just by visiting www.closethetap.co.za, taking a water-saving pledge, tweeting your pledge and sharing it on Facebook, you can help us spread the word, and save fresh water,” says Justin Friedman, creator of FLOW (www.flow.org.za). The United Nation’s 2012 theme for World Water Day is ‘Water and Food Security’, highlighting the link between agricultural and industrial water usage and the looming global lack of potable water. “Water is systemic and integral to all we do. It’s not just what you see coming out of the taps. Water is needed to grow and process our food, generate our electricity, make our cars, build our homes and our cities, and manufacture and transport the products we buy. We cannot live without clean water,” she says. NATIVE has created a live FlowCam connected to Twitter that is monitoring a flowing tap. With every tweet the tap will tighten a little with the ultimate goal of completely closing the tap when 10 000 tweets are posted. “The message we are trying to convey is that by making small adjustments to your everyday life, you can reduce water wastage and help us create awareness around the litres of water we literally pour down the drain every day,” says Adam Whitehouse, executive creative director: design at NATIVE. While industry and agriculture are the biggest water users globally, they’re keeping up with a demand for high water usage products, from us. “Each product we buy, or use, has a water footprint. Think 140 litres for a single teaspoon of instant coffee or 2 700 litres for a new cotton shirt. When just 2.5 percent of all water on the planet is fresh, and only half of that is available to us, it’s time to think twice about that next cup of coffee, or that lunchtime shopping spree. We are calling on everyone to visit www.closethetap.co.za and tweet a pledge so we can stop of the flow of water today,” Friedman concludes.